"The pearl of the kingdom"
a co-operation with the French costal city Saint-Malo and with other cities in the UNESCO project "Urban Development and Freshwater Resources: Small Coastal Cities"
on the northwest coast of Africa..
Essaouira is an outstanding and well preserved example of a late 18th century European fortified seaport town translated to a North African context. With the opening up of Morocco to the rest of the world in the later 18th century Essaouira was laid out by a French architect who had been profoundly influenced by the work of Vauban at Saint-Malo. It has retained its European appearance to a substantial extent. 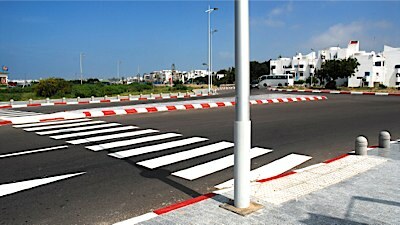 Freshpainted pedestrian crossing at the entry of Essaouira town. A wilayah is an administrative division, usually translated as "province" or "governorate". The word comes from Arabic w-l-y 'to govern': a wali 'governor' governs a wilayah 'that which is governed'. Explore interesting places in the town of Essaouira and in the Province. 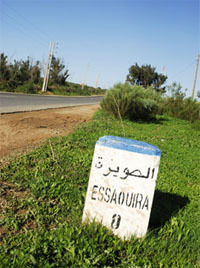 Road sign in Ghazoua . and the village is also called" km 8". The city of Essaouira was chosen by television "Travels" of Fox Group as one of the top 10 global tourism stops, considered "destinations of happiness." and handicraft production. This has had severe repercussions on the quality of life and the environment. The cultural heritage has suffered degradation and continued expansion of the city inland is threatening its fragile ecosystem and the very survival of the town. Capacity-building efforts focus on setting priorities for action, targeted human resources development, institutional strengthening, development and adaptation of tools, encouraging partnerships, mobilization of resources, and promoting exchange between cities facing similar problems. 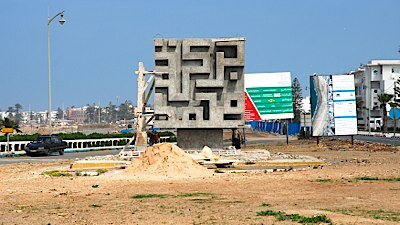 UN Habitat project and its partners has eveloped action plans, addressing issues such as the protection of the collapsing sea retaining wall and dilapidated city gates, a revitalisation plan for the Mellah area and development of an urban park as a buffer zone between housing estates and a dune forest. King Mohammed VI launched the “The Plan Azur Vision 2010” strategic tourist development program in January 2001, aiming to make Morocco one of the world’s premier tourist destinations with a target of 10 million visitors in 2010 and to create 600.000 new jobs. 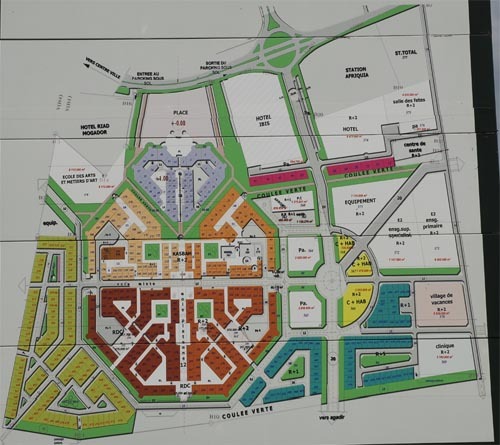 In the area of Diabat this development will measure in the region of 5,700.000 m2. The main features of this development are sure to be the two Gary Player golf courses. One of 36 holes the other 18. The hotels, riads, villas, golf academy and practice course are laid out along the two spectacular courses facing the sea.It also incorporates the upgrading of motorways and roads. Because of dune forest and the green belt there is a limit in the expansion of the city towards north and east. 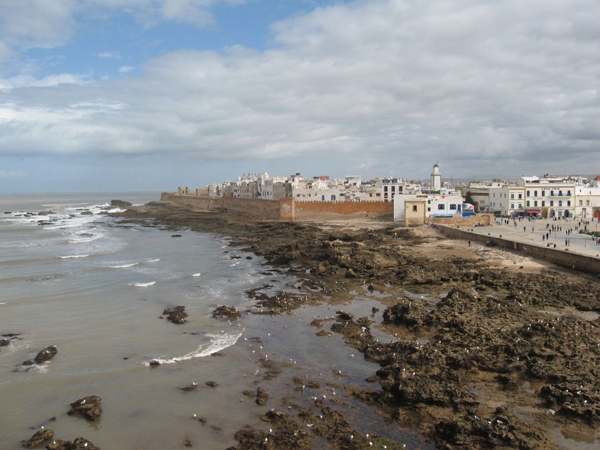 Chaabi Lil Iskane,began the construction of a new city: Essaouira El Jadida in Ghazoua ( 8km south of Essaouira). The small village in the countryside has developed into a residential area with villas, small buildings and businesses. is situated about 15 km south of the town. 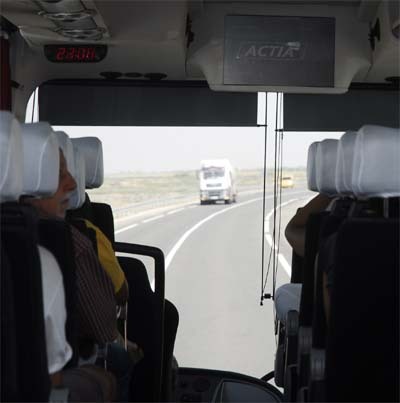 to Superhighways to Casablanca, Marrakech and Agadir. 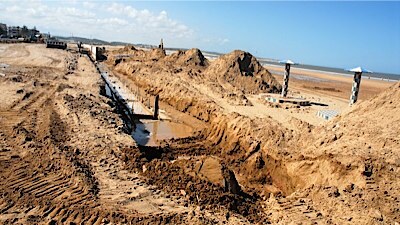 Extension of Essaouira town southwards. On top to the right you see the Express road from Marrakech enter the town. New settlements. South of Essaouira bordering the Duneforest. 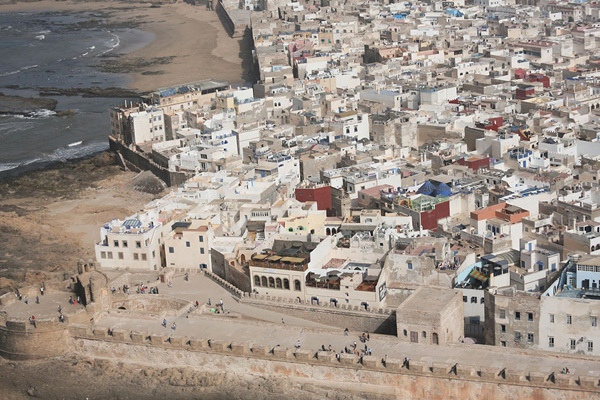 Announced at the University of Essaouira in January 2011, "urban renewal program in the province of Essaouira" focuses on the challenges of sustainable development. The quality of life for people, environment and economic dynamics as well considered, beautification and landscaping job in urban centers should be spread over four years and be completed in 2014. 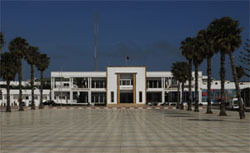 The project concerns the town of Essaouira, but also Ounagha, Talmest, and Tamanar, Hanchane. 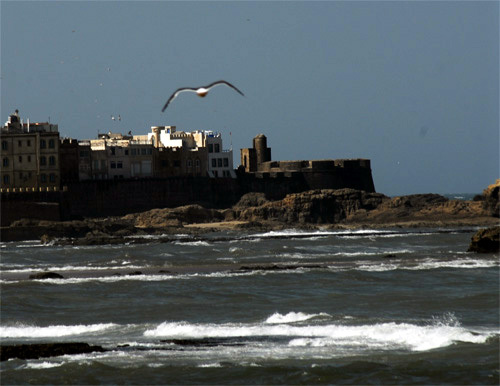 In Essaouira is the entire city from north to south, from east to west, which will be redeveloped. The Association Essaouira Mogador was founded at the initiative of André Azoulay souiri and activists in 1992. 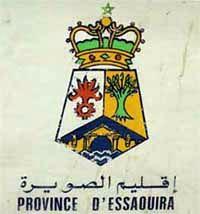 It first took the name "Association for the Protection and Promotion of Essaouira" (ASPDE), becoming in 1997 to become the Association Essaouira / Mogador. The preparation of dossiers and issues concerning the Sustainable Development of the city and the region. Essaouira has been elected by the TV channel "Voyages" Fox Group as one of the top 10 global tourism stops, considered "destinations of happiness." Rabat - Ses portes, sa plage, sa Côte Atlantique. Essaouira from the sky begins at about 13:50 in this 25 min video.